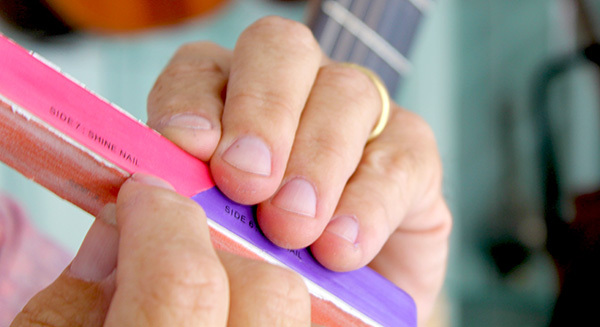 Hooked fingernails can be a real nightmare for a classical guitar player. Hooked fingernails can spoil your guitar technique because they will prevent your fingernails from going across the string smoothly. I offer 2 techniques that work beautifully. The soldering iron technique is my preferred technique. Fingernails have been and will always be a major concern for the committed guitar player. Vihuelists, lutenists, and guitarists from as far back as the sixteenth century have been debating about the issue. Therefore, when a student brings up the issue, he is adding his impressions to this centenary arena. Many guitarists prefer the no-nails approach to guitar playing, still, they will find interesting material to read further down. 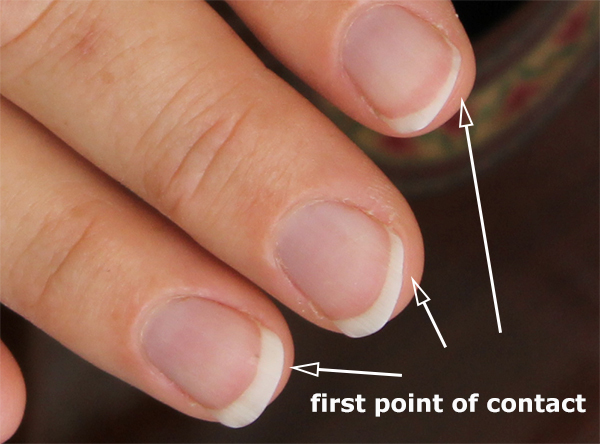 The often misused term nail approach generally refers to a right hand finger stroke that is actually a mixture of fingertip and fingernail. Using only nails tends to produce a thin, plastic sound, using only flesh produces an opaque sound, one that lacks in brilliance. The thickness of every individual's nails, as well as the width and curvature of nails, are all factors that have a direct influence on the sound quality produced by the guitarist. It takes a few years to become experts with one's own nails. "The guitarist must eventually master his nail care or he will simply never be a master". This does not mean that one has to walk around polishing his nails (this is a typical guitar competition stupid attitude). What this means is that the guitarist must develop a conscience where he is very aware of how closely related nails and sound are. Nails are to the guitarist what vocal chords are to the singer. Still, the best comparison is the painter's brushes. That is how important fingernails are. The ones above are some of my wife's brushes. They speak eloquently. The guitarist must be able to change the angle of attack to the strings in order to produce a wide variety of sound. Just as it is true that some people are blessed with perfect fingers, hands, inner ear, etc., it is also true that some people are blessed with perfect nails. It is not easy to describe the perfect nail because the way to see them is that they are more or less perfect according to the playing position that we use. 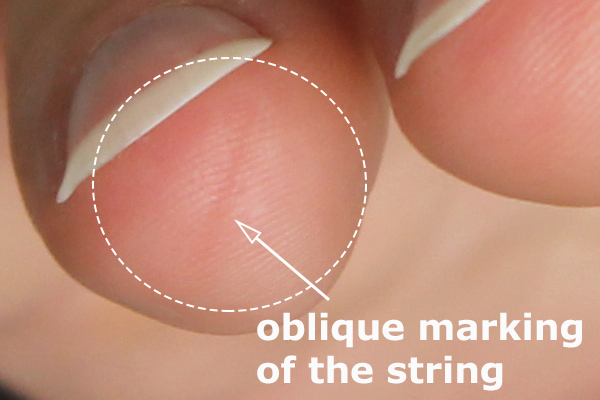 We'd be more or less lunatics if we tried to play at a perpendicular angle with the strings if our nails are too thin or hooked downwards (Williams, Parkening approach). Usually, playing with the right hand fingers perpendicular to the strings, means that we are twisting the right hand wrist sideways beyond health line. Malformations to the hand occur if we persist on this approach. These are the nails I recommend. 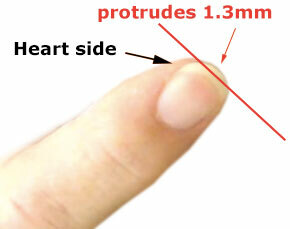 Rounded or sliced to an angle with the shorter part towards the heart. The second one is the most professional way to go about the nails. This filing allows for great contact with the flesh prior to the nail attack plus, it is almost impossible to get hooked with the strings and the fingers will be helped in the stroke starting from the main knuckle of the hand. You must polish and buff your fingernails daily. 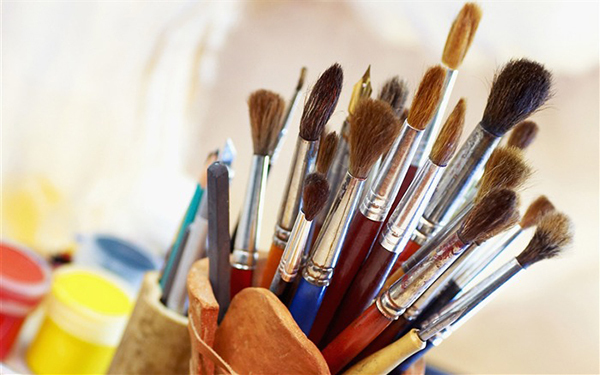 You will only need to file them every 3 or 4 days but buffing is essential on a daily basis if not 2 or 3 times a day. Buffing more than once a day is essential when you practice for over 4 hours every day. Buffing takes care of the unevenness generated by the friction of the strings with the fingernail which makes the sound harsh unless you buff it. You can find many different buffing and filing elements on the internet and local pharmacies and I recommend you keep one handy at all times. Study your fingernails thoroughly and do not assume that you will use the same shape your whole life. With the years, fingernails get thicker, your body changes and so does your overall sitting position and, ultimately, the angle of attack will also change. This is a close-up picture of typical right hand nails. Players often use different shapes according to their level of playing or the repertoire they are playing. The way I use my nails is: very well polished; if you practice more than 3 hours a day (you better not practice more than that or the next web pages you will be visiting are a shrink's pages), you should polish them again, using an ultra fine nail polisher (picture below; a piece of cardboard can do the job), longer-to-shorter (a, m, i) and slightly shorter on the playing side and, possibly, clean. One week before concerts I file my nails a little shorter than usual and let them grow keeping them polished all the way through the concert. Some pieces may require the use of the right hand little finger as well as the use of the left hand thumb (do not worry, you will know when to use the left hand thumb to stop notes) so these nails and fingers should be cared and trained also (rasgueados may require the use of ch (little finger) although I use this fingernail mostly to keep a consistent look on my right hand. It is already difficult to explain long nails on a guy, let alone 4 fingernails and not all 5 of them). The best guitar sound is achieved using a mixture of both flesh and fingernail. With regard to the thumb-nail, keep it fairly long and somewhat square towards the edges. It is the nail that gets most wearing during playing due to the roughness of the bass strings. The thumb works in the opposite direction than the other fingers. Some guitarists do not use a thumb- nail and others, like me, use it changing the nail's plucking angle to achieve a more round (bassy) sound or a thinner bass sound. Other times the flesh only is used to achieve a soft-round bass sound. Abel Carlevaro and many of his students have also developed a "fourth-bass-sound" achieved by slicing through the bass-strings. It is a matter of good taste to chose the right plucking mechanism at the right time. The thing you see down here, is neither a joke nor trademark. I clarify this because some visitors have asked me if I "Was joking". I asked back: "You mean about the thing or the trademark?" - I recommend that you use your common sense and stay away from the thing if you are not sure about what you are about to do. 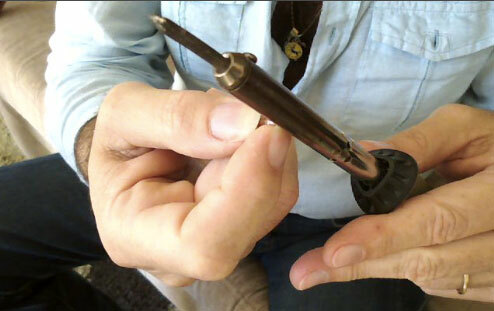 I designed this device for severely hooked fingernails. Experience has proved that mastering your filing skills will solve most fingernail problems. An even better system I have just started implementing little over a year ago is "The soldering iron nail technique". 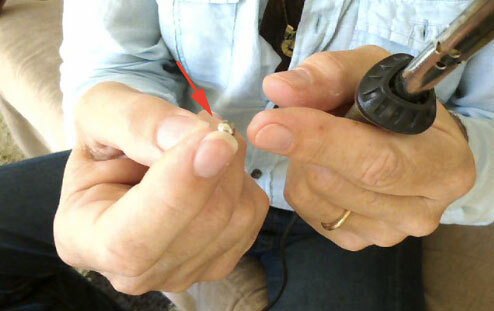 What you do is basically heat up the top part of the fingernail tip with a heated soldering iron while you push the fingernail upwards from underneath using a tuning fork. The way this occurred to me was by watching how the sides of the guitar are bent in my guitars workshop with a hot iron. I said to myself "if heat can bend wood it will most certainly bend a hooked fingernail". It does and I consider this technique the very best around because it keeps your fingernails straight for 7-10 days. Needless to say, practice the technique without plugging anything first so as to avoid unpleasant accidents. Look at the video below for instructions. 1) I like to use my tuning fork to push the fingernail because it has a rounded head and it is just the right length. You can use different things that best serve this purpose. What is important is that the instrument you use be short enough for you to hold and make pressure with one hand. 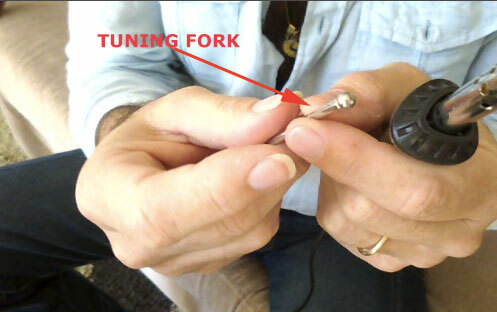 2) The rounded tip of the tuning fork pushes the fingernail upwards from underneath. The idea is that as the fingernail is being pushed upwards, the heath coming from the soldering iron I will use in a minute will change the shape of the nail. 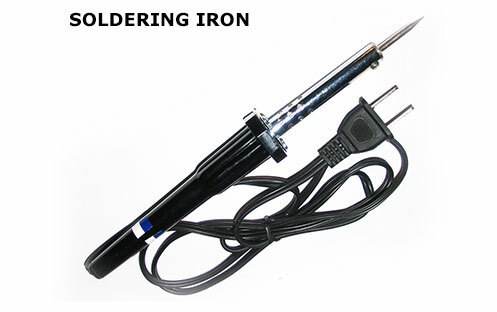 I use a soldering Iron I purchased at Radio Shack. I heat it up for approximately 2 minutes, then I unplug it and use on the fingernails. You can also use it plugged but you have less control over how heated it is. It must be hot but not to the point where you can burn the fingernail. I suggest you use it unplugged until you are more experienced. You can also wet the fingernail with the tip of your tongue prior to heating it up so as to avoid overheating it. 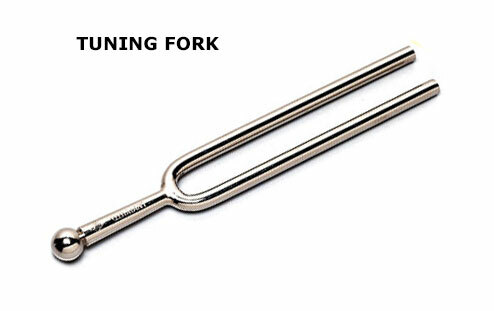 What you do is heat the fingernail as it is being pushed upwards by the tuning fork. The concept is very simple and genial and, naturally, works perfectly. What happens is that the heat changes the molecular structure of your fingernail making it more flexible and allows you to shape the nail to your pleasure. My name is Damon Mazzocco. I quit playing classical guitar in 1991 when my own recordings did not sell. A year ago I began to seriously play again. My own nails "hook" so very horribly. They always did. It always "hurt" to play. It is one of the reasons I quit playing. I have tried EVERYTHING to rectify the problem. 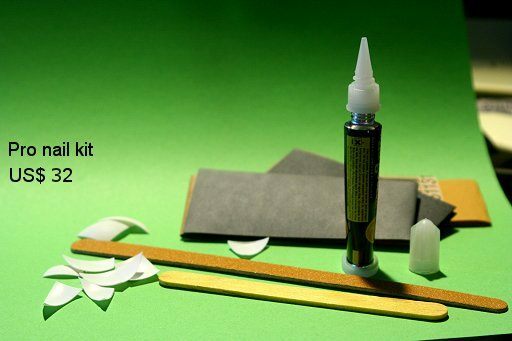 Glue with prosthetic nails ALWAYS created a skin rash for me, etc. I COULD NOT BELIEVE I "stumbled" upon your video this evening. : ) : ) I did what you suggested, but I did it with a regular iron that I use to iron clothes. I simply heated my nails along the edge of the iron. I pushed my I, M and A fingernails up by using my thumbnail. IT WORKED ! ! : ) I then did it again, but instead of using an iron that we use for clothes, I used a "flat iron" that women use for straightening their hair. IT WORKED EVEN BETTER < : ) The point is that after I heated the nails, they certainly protruded further beyond the fingertips, as they were now "straight" and therefore longer. I spent about an hour readjusting my right hand to play off the tip of the nail and then gradually (over and hour or so) combined the use of flesh and nails. Only an hour ago, without ANY hesitation or resistance I was able to play the Villa Lobos Prelude No. at 180 PBM. I could not even do that in university in the late 1970' s ! : ) By all means, you should try heating your nails with the flat iron that women use. It is much easier to control when you put the nail on the hot surface and share this information with others. Further, because my nails hook so badly, I was actually going to "break down" Jazz Gutiar next week. So much of our repertoire sounds horrible on an electric. But at one point I thought it was the only way I could control the sound. I want to thank you so very much for putting that video up there. It was "perfect timing" because tomorrow I was going to cut my nails and use fake nails again. I can not impress upon you grateful I am that I saw your You Tube film regarding this matter. I wish you the very best, Sir. Peace and Profits, Damon Mazzocco.